The coat of arms of the present-day German free state of Saxony shows a tenfold horizontally-partitioned (Barry of ten) field of black (sable) and gold/yellow (or) stripes, charged with a green (vert) crancelin (a stylized common rue) running from the viewer's top-left to bottom-right (in bend). Although the crancelin is sometimes shown bent (embowed) like a crown, this is due to artistic license. The coat of arms is also displayed on the state flag of Saxony. The shield "Barry of ten sable and or, a crancelin vert" deduce from the Saxon counts of Ballenstedt (in present-day Saxony-Anhalt), ancestors of the ducal House of Ascania. The Ascanian margrave Albert the Bear achieved the Saxon ducal title in 1138; when his Welf successor Henry the Lion was deposed by Emperor Frederick Barbarossa in 1180, Albert's son Bernhard, Count of Anhalt received the remaining Saxon territories around Wittenberg and Lauenburg, and the ducal title. Legend goes that when he rode in front of the emperor, at the occasion of his investiture, carrying his escutcheon with the Ballenstedt coat of arms (barry sable and or), Barbarossa took the rue wreath he wore against the heat of the sun from his head, hanging it over Bernhard's shield and thus creating the Saxonian crancelin vert. From about 1260, the Duchy of Saxe-Wittenberg emerged under the Ascanian duke Albert II, who adopted the tradition of the Saxon stem duchy and especially took over the Saxon electoral dignity, against the fierce protest of his Ascanian Saxe-Lauenburg cousins but confirmed by the Golden Bull of 1356. The Saxe-Wittenberg black and golden shield already displayed the Gothic crancelin, probably symbolizing the waiver of the Lauenburg lands. As the Ascanian Electors of Saxony also held the High office of an Arch-Marshal of the Holy Roman Empire, they added the ensign Per fess sable and argent two swords in saltire gules (the later Meissen swords) to their coat of arms. When the line became extinct in 1422, the arms and electoral dignity were adopted by the Wettin margrave Frederick IV of Meissen. § 1 (1) The lesser coat-of-arms of the Free State of Saxony shows an escutcheon bendy of nine pieces black and gold, a green rue-crown bendwise. (2) A greater coat-of-arms of the Free State of Saxony can be determined by a special law. 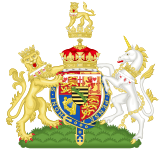 § 2 For the rendering of the coat-of-arms the patterns, which are attached to this law as appendix, are authoritative. The coloured patterns are deposited in the Main Public Record Office of Saxony. § 3 The regulations necessary for the implementation of this law are issued by the State Government. It can pass on this authority. § 4 This law comes into force the day after its proclamation. The preceding law is executed herewith and is to be proclaimed. —  Prof. Dr. Kurt Biedenkopf (Minister President), Steffen Heitmann (State Minister of Justice), Law relating to the coat-of-arms of the Free State of Saxony Of 18 November 1991,(Saxon Law and Official Gazette 1991, p. 383-385), Dresden, 18 November 1991. The Constitution of the Free State of Saxony adopted by the Landtag on 26 May 1992 stated the country flag displays in a ninefold partitioned field of Black and Gold a right diagonal green crancelin. Electorate of Saxony (1356-1806) with the crossed swords of the Imperial Arch-Marshal and the green crancelin. ^ a b Freistaat Sachsen official website Archived 2013-01-22 at the Wayback Machine (in German) Accessed 2009-05-19. ^ Hitlers Mein Kampf: "The Saxons are so strong bastardisized"... ...."We should use the new forms of our symbols to protect the meaning of our time."